It’s fall and that means football in the Deep South. I reckon instead of calling the South the Bible Belt, they should call it the College Football Belt because football is THE religion in these parts. And this wasn’t just any weekend: it is the Third Saturday in October, aka Alabama-Tennessee football weekend! Today Dad and I took off for a football weekend. Because there is a multi-year waiting list for Alabama tickets, we decided to hit the road to watch the Crimson Tide play. And what better place to go on the road than to the beautiful mountains of east Tennessee in the fall with its changing leaves? We left in the morning from Birmingham heading up I-59 North, before cutting through northwest Georgia and on to I-24 towards Chattanooga. Then we took I-75 and I-40 to Knoxville, where we stopped for lunch. For the next couple of nights, we would be staying in the Smoky Mountains, so we headed down I-441 to Sevierville and Highway 321 south to Pigeon Forge and Gatlinburg. 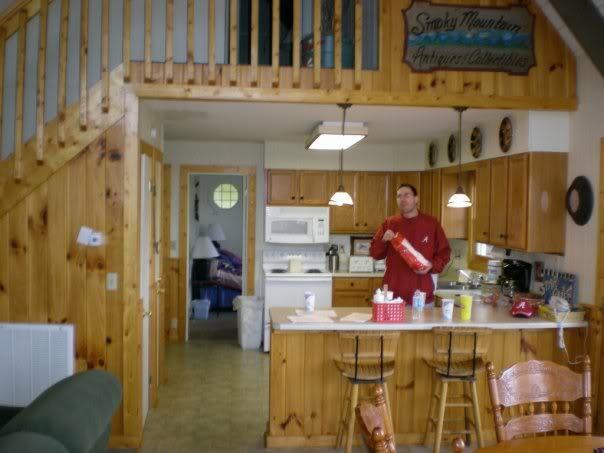 We drove to a rental consolidator place in Gatlinburg and booked a cabin to stay in. Unfortunately when we arrived at our cabin, the place wreaked of cigarette smoke and had other problems. We complained and they upgraded us to a deluxe cabin high up in the mountains, not far from Ober Gatlinburg ski area. We drove up narrow drives past houses and vehicles bedazzled with UT orange. With our Bama flags flying proudly from our SUV, we were outnumbered in this area and received some not-so-pleasant gazes. Eventually after ascending the snakiest, steepest and narrowest of roads, we arrived at a three-bedroom log cabin perched on the side of the Settler’s Ridge Resort. The cabin, called the Stargazer, was amazing and had a huge deluxe fireplace. 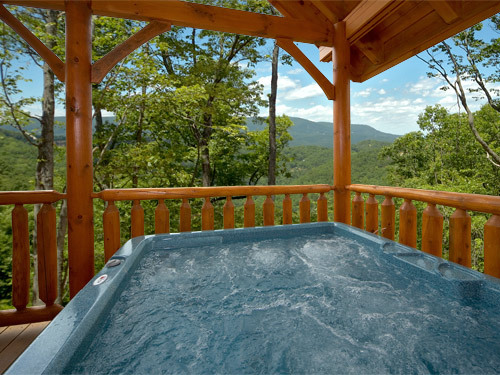 It slept up to 8 people on two levels, and had a dining room and private covered deck with jacuzzi overlooking Mount LeConte and the Great Smoky Mountains. We could see the cable car flying by to the top of Ober Gatlinburg Resort not far to our left on the patio. We also had a game room with a pool table and big-screen TV! We decided to relax this evening. Dad and I had some pizza that we picked up and watched a couple of movies on DVD. We also enjoyed the jacuzzi before hitting the sack.